Warning, Concealed CCTV cameras operate on these premises, mini safety sign. 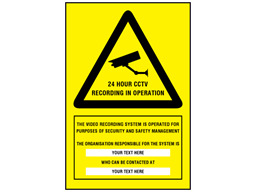 24 hour CCTV recording in operation signs with custom text. Available in 3 sizes, and in 2 materials. Minimum quantity requirement of 4 signs. Part of our site security and premises management sign range. Custom CCTV signs. 24 hour CCTV recording in operation. Minimum quantity requirement of 4 signs. Available in self adhesive vinyl, rigid plastic, and self adhesive vinyl with adhesive on face (for fitting on inside of glass). CTV300 Size 150mm x 100mm. Material self adhesive vinyl. CTV301 Size 150mm x 100mm. Material rigid plastic. CTV306 Size 150mm x 100mm. Material self adhesive vinyl (adhesive on face). CTV302 Size 300mm x 200mm. Material self ahesive vinyl. CTV303 Size 300mm x 200mm. Material rigid plastic. CTV307 Size 300mm x 200mm. Material self adhesive vinyl (adhesive on face). CTV304 Size 400mm x 300mm. Material self ahesive vinyl. CTV305 Size 400mm x 300mm. Material rigid plastic.